Burma has shown real signs of progress. But can it put an end to conflict with its ethnic military groups? In Kachin State, Burma’s reform bandwagon has hit the buffers. The government of President Thein Sein has made progress in halting its forever wars with most of Burma’s rebel armies, and the Shan State Army (North) last week became the latest of the country’s ethnic military groups to reach a ceasefire agreement with Naypyidaw. However, the Kachin Independence Army (KIA) and its political affiliate, the Kachin Independence Organization (KIO), walked away from talks without agreeing to a ceasefire deal. The immediate outcome was a return to hostilities, more deaths, and claims from the KIO that the Burmese government was yet to enter seriously into a political dialogue. Ending Burma’s deep-rooted civil wars is perhaps the ultimate test of Thein Sein’s reform-minded regime. 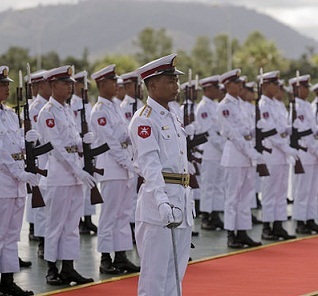 It was only in June that the Tatmadaw, Burma’s armed forces, renewed hostilities with the KIA, abandoning a 17-year ceasefire in the hope of bludgeoning the group into assuming its required role under the country’s new constitution. The president’s order for the offensive to cease, issued just six months later, highlighted the speed at which the government appeared to have woken up to the fact that the sledgehammer traditionally reserved for the handling of ethnic affairs no longer sat too well with its progressive new image. To encourage the KIO to come back to the table – and convince the international community that he wants to accommodate, not endlessly punish, Burma’s ethnic minorities – Thein Sein has to move on from this initial setback and start establishing grounds for trust with the Kachin leadership. First, he has to get the Tatmadaw to obey his December ceasefire order. Reports of more government troops arriving in Kachin in January and ongoing hostilities give the impression that the Tatmadaw continues to follow its own writ out in the provinces. If, as reports suggest, army chief Min Aung Hlaing really is supportive of the president’s reform agenda, then he should bring his field commanders in Kachin to heel and tell them to stay in their barracks. Once the shooting really stops, Thein Sein should then consider international mediation. The president earned plaudits for granting U.N. access to at least some of the 50,000 internally displaced persons who are victims of the fighting in Kachin. That access should now be expanded, and neutral parties invited to help build a framework for far-reaching peace talks – not just with the KIO, but with other armed groups whose ceasefires could easily lapse if permanent settlements are not reached. The Philippines, which is making promising headway in resolving one of its own long-running insurgencies with Malaysian assistance, provides an obvious model for Burma to follow. The establishment of a new peace process sponsored by Association of Southeast Asian Nations and the United nations, and perhaps held in a neutral ASEAN member state, would be an impressive gesture, both from the perspective of groups like the KIO and of an international community still unsure of Burma’s trajectory. Thein Sein has so far picked up many of the gauntlets thrown down by doubters of his reformist agenda. But addressing the 60-year-old grievances of Burma’s rebel groups will be his biggest challenge yet. Will Myanmar Backslide on Human Rights?